Order Now – Gavin Seim’s American Original Prints. $99, Includes US Shipping. Order your open edition prints above. Simply indicate the title or image in the box before “adding to cart”. Prints ship in 2-3 days. International shipping is $12. Currently available prints can be viewed in the Color and Silver folios. Gavin’s stunning Open Editions are printed or supervised by Gavin. Based on the master and reproduced to ultra high quality standards, they are presented as 24 inch archival mounted works ready for framing. Presentation is your choice, but Gavin recommends custom framing with a liner only, or by matting using black or white and at least 3 inches of space per side. Framing is also available through the gallery. 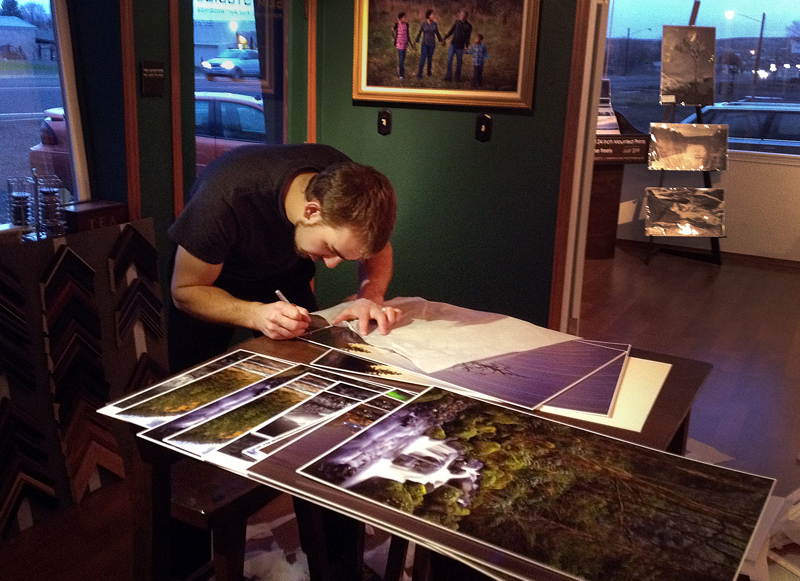 Gavin signing and inspecting Open Edition original prints after mounting is finished. An American Pictorial is in a class of it’s own. Open editions are hand initialed by Gavin and come mounted with a thin border for presentation and archival protection. This can be covered when the print is placed in a frame. All prints are 24inch nominal on the long edge, including the border. Height is determined based on the ratio of the final piece. Currently available prints can also be viewed in the Color and Silver folios. To learn about the larger Limited Edition offerings from each release, visit the journal or contact the gallery. To learn about retail opportunities for the American Originals Collection, contact us. Click here to learn about Limited Signature Edition Prints.